As Nora's health declines, they both dare to hope that the magic of a strange pendant Ben purchased from an antique shop as a gift for Nora will overcome the odds, offering them more time with one another. John Mc Caffrey writes tales of horror, the supernatural, science fiction, and fantasy. He was born in Illinois and grew up on the south side of Chicago. While still in grade school, he developed a passion for reading through the works of Tolkien, Poe, and Lovecraft as well as being addicted to watching Hammer Film's at the local Saturday matinee. Today he lives in Northern Indiana with his wife where he writes in his spare time. I was hooked from the first few pages. I feel like I know these people. Compelling to say the least. This is a beautiful, endearing, romance novel written to hold your attention to see what lies ahead for the ill Nora O’Connor (who’s in her 70’s) and Ben Jameson, her 75 year old, reluctant friend both who reside at Willow Manor Retirement and Convalescence Home. Ben was placed in Willow Manor due to his inability to walk properly because of bad hips and knees. He is no longer able to drive himself and this has depressed him greatly. Since he can no longer fend for himself, his son, Edward, places him in Willow Manor with promises of phone calls and family visits but the only time he does come and visit his Dad is when he needs paperwork signed for his inheritance – which he wants now. At the home, Ben watches. 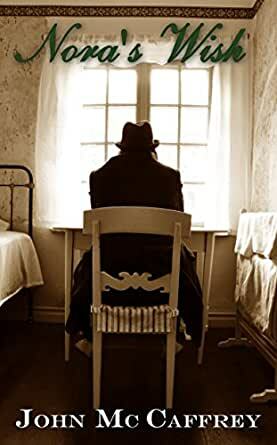 He watches the nurses go about their daily routines, his roommate, the gurneys that pass by his door every so often, the other residents, and out his window where he remembers that he once loved the sunrises. Ben doesn’t like to be fussed about – he can take care of himself just fine, so he shoos away help, counseling, rehabilitation, and fellow residents. He likes to read by himself, in his room or outside while feeding the ducks. He avoids everyone as much as possible. Nora’s been at Willow Manor Retirement and Convalescence Home for about a month. She’s a very nice woman who is terminally ill and is destined to remain in a hospital bed unable sit totally up or walk and with deteriorating vision. Nora is bright and enjoys company. She has little family and hasn’t had any visitors. Nurse Ratzer, is a kind and considerate nurse who makes it her business to know little things about those who are under her care. She’s well-liked by all and tries to give comfort where she can. She knows that Ben has come to live in the home and is adamant about keeping to himself. He doesn’t want to be there at all and is very bitter and full of regret. Nurse Ratzer sees that Ben is in need of companionship and takes it upon herself to arrange with Ben a reading session with another one of her patients, Nora, who Nurse Ratzer says has a love of books but who is unable to read anymore due to vision loss. Nurse Ratzer sees Nora’s pain and knows that she’s lonely. She has a good soul, so she devises a plan. The plan is that if she can talk Ben into sitting with Nora while he does his reading and read aloud to her a little every once in a while, Nora might feel a little better. She tells Ben that Nora is an avid reader but her illness has taken away that love in her life. At first Ben is reluctant. He does not want to socialize with anyone, but he likes Nurse Ratzer and he wouldn’t want to be bedridden and unwanted himself so he will do her this favor one time and that’ll be it. It takes a few days for Ben to make it to Nora’s room. He stands outside and watches. He watches Nora O’Connor gaze out the window for a long time. She doesn’t know that he’s there & her roommate is fast asleep. Nora senses that she is being watched and turns her head. She cannot see anything except a blurry outline of a figure but she smiles and it lights up her face & eyes – she is radiant! Ben is captivated by Nora’s smile, her eyes, her plainness and her beauty. She draws him into her room. Her voice is low and warm. He is dumbfounded at first and barely gets out his first name. He’s really nervous but he begins reading to Nora. He comes back a couple of times each day and reads to her until she falls off to sleep. The first book is completed and Nora speaks of the wonderful time that they have spent together. She opens up a little a lets it slip that she was never an avid reader. Ben gets upset but Nora tells him how happy she is that the lie brought them together. He is hurt and says that he won’t bother her anymore with reading. Nora stops him. She says that she enjoys how he reads to her and that she loves his company. She says that she is happy that Nurse Ratzer brought about the ruse. Ben agrees. The two begin to talk about their lives growing up and family. They realize that they grew up in the same town and went to the same school. They have a lot in common. Ben’s empty life is suddenly filled with tenderness and affection. Nora believes there a bit of magic going on. Ben reads to Nora all of the time. When she falls asleep, he is patient and waits for her to wake. She doesn’t want him to leave either. They talk and reminisce and before long, a love transpires. Ben ponders about life and how precious it is and how fleeting. He realizes how more precious the people who we touch and who touch us during our lives are. One Friday, Ben catches the bus that takes some of the residents to town a few miles away to shop. He heads for the Used Book Store in search of the romance novels Nora has requested. Martha, the store owner helps Ben locate books for Nora. She also shows Ben a necklace. It has a clear stone about and is on a silver chain. She says that it’s a WISHSTONE from Ireland and it’s said to be magical. Marth tells Ben that the owner of the necklace can make one wish if they are true of heart. Ben is assured that he cannot afford such a gift on his limited budget but Martha asks him how much he has and she settles for $10.00. She puts the necklace in a box, wraps it and puts a bow on it. While Ben is in town, Nora is taken to the hospital. Nurse Ratzer tells Ben that Nora’s advanced heart disease is taking its toll. Ben is told that Nora doesn’t have long to live. Ben goes to see Nora at the hospital. She looks frail and it breaks his heart to see her like this. She says that she’s had a tough life and almost gave up couple of times, but since she’s met Ben she wants to live and be with him. He tells her that he feels the same way. He visits with her for a while and tells her of his shopping trip. He pulls out the small wrapped box and places it in her hand. She loves the necklace. Ben tells her Martha’s story about the magic the WISHSTONE holds. Nora falls off to sleep and awakens in a start. She tells Ben that she knows her wish; she wishes that she met Ben Jameson a long time ago. She wishes it very much. Ben says that he wishes that too. Nora’s back at the home in a week but she isn’t doing well at all. Her breathing is much more labored and she is weak. Ben just holds her hand and gazes into her eyes. Ben is given the news that she only has another day or two, there is nothing more that they can do for her. Ben wants so much to help Nora, to take away her pain. Nora wakes and asks Ben again about what Martha had said about the necklace. Nora tells him that she made a wish for both of them. She tells him to take the necklace and make his wish. He removes the necklace from Nora’s neck, he clutches the WISHSTONE in one hand and holds Nora’s hand in his other one. He leans down to the dying woman and whispers in her ear “I love you Nora”. He releases her hand and stands straight up as the machines around Nora sound their alarms. He closes his eyes and makes his wish. With the alarms screeching and lights flashing, chaos breaks out in the ward. Doctors and nurses get called to Nora’s room. Nurse Ratzer, hits Nora’s room first and swings the door open to an empty room. She checks the bathroom but again, there’s nothing. She can’t even remember why she came to the room. She bumps into Nurse Sheila who asks if the room is ready for their new patient Mr. Johnson. Nurse Ratzer is confused. Something isn’t right but she can’t put her finger on it. As she’s leaving the room, she notices a sparling object under the bed. She finds a silver necklace with a clear stone. It gathered all of the sunlight in the room and she is amazed by its sparkle. She places it in her pocket and closes the door quietly. Once again we see that where there is true love, magic happens – it happened for Ben and Nora. The author, John McCaffrey’s style in writing is straightforward and easy to read. He has the reader relate to this couple in an entertaining and sometimes difficult story. I felt as if I was seeing them in my personal life. I was hooked from the beginning. I felt for all of the characters. I was rooting for Nora to get well and spend the remainder of her life with Ben. This was a great story and I look forward to a sequel from this talented author.